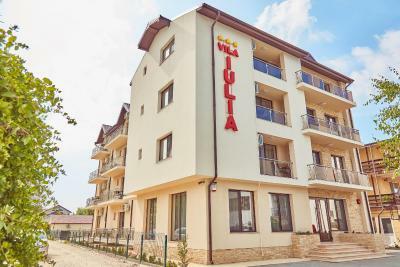 Lock in a great price for Vila Iulia – rated 8.9 by recent guests! Clean, modern villa, no problem in finding a free spot in the parking lot, which is also monitored, by the way. Brand new property, very helpful staff, across the street from a very quiet and clean beach (3 minutes walk). Card controlled access in the villa after 8 PM till 8 AM. Private parking. Clean, Spacious, Good quality finishes, Family friendly, well maintained. Modern and clean hotel with a comfortable bed. Our room had a lovely view over the town and ocean with a balcony for breakfast. Very quiet too, we didn't have neighbours but there was zero outside noise. There is a kitchen and eating area too, which is great if you don't want to eat out every night. The guy on reception speaks English and is friendly. The location was ideal for the conference I was attending and you can get the bus in to Constanta easily from outside for 5 Lei. The beach is a short walk. It felt like we got a bargain for the price. Very friendly staff. The bed and the pillows were very comfy. Everything is very clean and new - cozy accommodation. The hotel is very new, the interior and exterior are very nice and clean it exceeded my expectations! Money and quality wise was perfect. Close to the clubs on the beach (5 mins ride). Good amenities such as 2 supermarkets next to the hotel. camere spatioase, mobilier nou, conditii foarte bune. Locatie buna, curatenia si apropierea de plaja. Au raspuns prompt solicitarilor (se stricase ceva in baie si au reparat imediat). Located in Mamaia Nord, Vila Iulia is 1,150 feet from the beach. Free WiFi is provided. Featuring bright decors and warm, wood tones, rooms come with a desk and a flat-screen TV, a private bathroom with a shower, and certain rooms here will provide you with a balcony. The units at the accommodations feature air conditioning. The Holiday Village Mamaia is 5 mi away. The nearest airport is Mihail Kogălniceanu International Airport, 14 mi from the guest house. Mamaia Nord is a great choice for travelers interested in clubbing, kid-friendly beaches and atmosphere. When would you like to stay at Vila Iulia? This villa has a balcony, flat-screen TV and kitchen. House Rules Vila Iulia takes special requests – add in the next step! Vila Iulia accepts these cards and reserves the right to temporarily hold an amount prior to arrival. The towels was not ok, Very used, old and not clean white. The location is a not exactly what I expected it is a bit hard to find the vila and the surroundings are not amazing. The corridors were loud you could here kids screaming on the halls of the hotel in the morning, from the room. Although we knew that the location is pretty far away from the center of Mamaia, a very big problem for us with the location of this villa was the fact that no good restaurants or places too eat were around. "La Scoica" and "La Peste", although advertised as "classy" are anything but, with rude staff and bad service. No marked crosswalk in the nearby area.